Be the first to share your favorite memory, photo or story of Evadene. This memorial page is dedicated for family, friends and future generations to celebrate the life of their loved one. Evadene B. “Dene” Sanders, age 96, of Greenville, IL passed away Monday, November 19, 2018 at HSHS Holy Family Hospital. Funeral services will be conducted Friday, November 23, 2018 at 7 PM at The Greenville First Christian Church. Friends may call Friday, November 23, 2018 after 4 PM at the church. Private burial will be in McKendree Chapel Cemetery. Memorial contributions are suggested to The Greenville First Christian Church or The Bond County Senior Center. Dene was born March 7, 1922 in Seminary Township, Fayette County, IL to Hillard A. and Maggie (Cripe) Heather. She married Elvin A. “Pete” Sanders on April 15, 1939 in St. Louis, MO. He died November 19, 1990. She is survived by her children Judith Ann Dye of Omaha, NE, Nancy Irene Sanders-Latham and her husband Steve of Round Rock, TX, and Roger Sanders and his wife Jane of Greenville, IL along with eight granchildren and fourteen great grandchildren. She is also survived by two sisters Betty Fifer of Mulberry Grove, IL and Loretta Willis and her husband Harry of East Peoria, IL. She was preceded in death by her husband, three brothers Merle. L “Pete” Heather, Dale Dewitt Heather, and Harold Heather along with four sisters Mildred Siebert, June Miller, Roxie Stubbs, and Farrell Collier. She grew up in Seminary Township and attended Mulberry Grove High School. After her marriage she and her husband lived in Mills and Tamalco Townships where they farmed. They moved to Greenville in the mid 1980s. She was a member of The Greenville First Christian Church, Bond County Home Extension, and The Greenville Country Club. 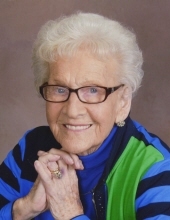 She had been a 4-H Leader and enjoyed Golf and Bowling. To send flowers or a remembrance gift to the family of Evadene B. "Dene" Sanders, please visit our Tribute Store. "Email Address" would like to share the life celebration of Evadene B. "Dene" Sanders. Click on the "link" to go to share a favorite memory or leave a condolence message for the family.